In addition to free Wi-Fi and an indoor pool Blue and White Motel also boasts a sauna and fitness center. 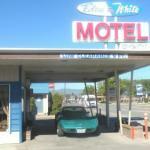 Blue and White Motel offers 106 rooms with free Wi-Fi cable TV a work desk and coffeemaker. Non-smoking rooms are available. Enjoy a refreshing splash in the year-round indoor heated pool or relax in the hot tub and sauna. Stop by the fitness center to keep in shape while on your trip. A laundry room is available. Pets are allowed and parking is free. Blue and White Motel is on Route 2 a block from Woodland Park. Travel one mile to visit the Hockaday Museum of Art or go 10 miles to Flathead Lake. It's seven miles to Glacier Park International Airport.